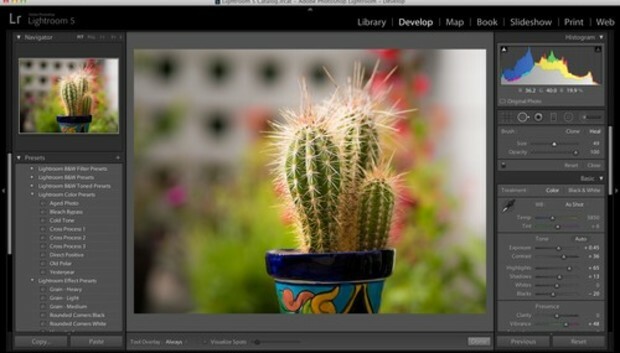 If you like Lightroom 4, you're probably going to appreciate version 5 even more. The latest iteration of Adobe Photoshop Lightroom introduces a new set of well-thought-out features while maintaining snappy performance. Our stock MacBook Pro 15-inch Retina Display laptop had no trouble importing large raw files, scrolling through hundreds of thumbnails, or applying sophisticated image edits. In other words, Adobe kept its house in order during this refresh. Some of the touted new features, such as Smart Previews and Upright, are quite innovative. Others are refinements to existing tools. Some of my favorite improvements didn't even make the top five list, yet make a noticeable difference in my interaction with the application. Full Screen Preview is an excellent example. Now, when you press the F key, your image is presented to you in true full screen with a solid background. It's beautiful. No more cycling through full-screen modes hoping to get what you want, but never receiving it. Lightroom 5 can now handle PNG files alongside common formats such as JPEGs and TIFFs. And a new -Q shortcut lets you toggle back and forth between Clone and Heal spot-removal modes. These are part of Adobe's signature Just Do It improvements that make image management a little more enjoyable. As for the stuff that's designed to grab your attention: As a group, these features are practical as well as impressive. Upright provides four modes to straighten images with a click of the mouse. Smart Previews lets you work on your images even when the originals aren't available. The Advanced Healing Brush corrects irregular shapes. The Radial Gradient tool provides a new way to direct your viewer's eyes to a particular area of the image. And Video Slideshows enables you to connect separate clips into a single presentation. If you want to leave your original files on a hard drive at home, but still have image editing capability in Lightroom, try Smart Previews. When you create Smart Previews during import, or on the fly (Library > Previews > Build Smart Previews), Lightroom builds lossy DNGs (Digital Negative versions) of those images. Even with the masters offline, you can still correct the photos and work with them as you normally would. When you reconnect the hard drive containing the masters, that editing information is retained. In my testing, I copied a folder of 254 raw and JPEG files from my Pictures folder on to an external hard drive. This would be the new home for 1.86GB of data. I then redirected my Lightroom Catalog to the external hard drive for those originals. With the external hard drive still connected, I next created Smart Previews for all 254 images. The Smart Previews added 347MB to my Lightroom Catalog folder (where the DNG files are stored in a container called Lightroom 5 Catalog Smart Previews). But I was then able to remove the 1.86GB of original files from my Mac, resulting in a net savings of approximately 1.5GB. There are a few things you can't do when working with Smart Previews. You can't print a photo book, make roundtrip to Photoshop, or apply noise reduction. You'll have to reconnect the hard drive with the originals to do those things. But for the most part, you can work as you normally would, and save a lot of space on your computer along the way. Adobe brings brush strokes to the healing tool (something that Aperture users currently enjoy), but with a nice twist. The basic improvement is that you are no longer limited to using circles for corrections. You can instead brush over a stray thread and watch it disappear before your eyes. When using the healing brush for portrait retouching, try the Opacity slider to diminish a facial line instead of removing it altogether. It's a more elegant correction. The twist I mentioned is that Adobe has added a checkbox labeled Visualize Spots at the bottom of the interface. When you check the box, you're presented with a graphical representation of the image that makes it easier to spot dust and dead pixels. An intensity slider can adjust the mask to help you best see the flaws for that particular image. Visualize Spots is easy to use and is effective when checking large areas, such as an expansive sky, for imperfections. Much to the envy of Aperture users, Lightroom photographers have enjoyed the linear Gradient tool for some time now. In version 5, they also get a Radial Gradient tool that allows for circular selections. Once you choose an area with Radial Gradient, you have 12 sliders for adjusting the area outside of the selection. If you wish, you can invert the mask by checking the box beneath the Feather slider, and apply the corrections to the area inside the selection. The Radial Gradient tool helps you focus attention to a part of the image where you want to direct the viewer's eye. In my example, the window light was just a bit too bright, pulling attention away from the subject. By using the Radial Gradient tool to tone down the window, I was able to make the composition a bit more balanced. Most of our digital cameras capture both stills and video. Now Lightroom can combine those assets into what Adobe calls a video slideshow. The best approach for organizing your movie is to put all of the assets--both stills and clips--into a Collection. The Collection becomes a holding area and storyboarding workspace. Once you're ready to create the video slideshow, select the assets you want to use, then click on the Slideshow module at the top of the Lightroom interface. Lightroom will create a video slideshow for you that you can further fine-tune, if you wish. This feature can also be used to connect video snippets into a short movie. Even though the ability to combine video snippets is an improvement over Lightroom 4, this module still needs work, especially if you compare it to the capability of Aperture's slideshow tool. Options for actually crafting your presentation in Lightroom are limited, and options for exporting are even fewer. The Upright tool is downright impressive and immensely useful. I haven't seen anything like it before. In my view, this is the killer feature in Lightroom 5. With Upright, you can quickly correct a tilted image by simply clicking a button. Upright is located under the Basic tab of the Lens Correction box and offers four modes: Auto, Level, Vertical, and Full. Level and Vertical are for images that need either horizontal or up and down adjustment. Auto looks at the entire image and is the most balanced option. I found myself using Auto most of the time. Full is more aggressive than Auto. If you want to continue to tweak the image, click on the Manual tab and take advantage of the specific sliders in that area. But more often than not, Auto Upright is going to get the job done. Lightroom 5 is a practical, finely crafted version of Adobe's excellent photo management application. The Develop Module continues to be the star of the show. But Smart Previews is clever, and should be well-received by laptop-toting photographers. If you're already a Lightroom user, the upgrade is practically a no-brainer. I also think that the $149 price tag represents a good investment for serious photographers who enjoy fine-tuning their images. DevOps: Where's all the security talent?